Most male animals have to fight all the other males before they can breed. Rhinos do not use that system. Instead rhinos rely on their sense of smell. 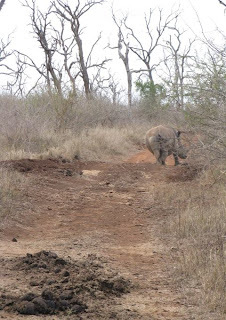 A female rhino can sniff a pile of dung one time and tell how healthy and virile a male is. This is something modern science has not even come close to duplicating. According to evolutionary theory, the first rhinos were a kind of tall gazelle. Then they developed their marvellous sense of smell. After that, there was no point in battles, the only thing that mattered was maintaining a healthy digestive system. Slowly rhinos became heavier and shorter. Three million years of selective breeding later you get the modern rhino. Essentially it's just a minivan with a horn attached to the front. It's not beautiful. It can't jump. It can't run more than a hundred yards. It can barely see. It's kind of surly. It's kind of stupid. The only thing it's good at is digesting. But, boy, are rhinos ever good at digesting! You can feed them old boots and car tires and what comes out is the highest grade manure. The top tulip farmers in all the world rely on rhino manure exclusively to fertilize their prize winning bulbs. You realize that the rhino manure was basically a joke right? They didn't evolve from some other animal. The tulip farmers don't collect rhino manure. They do sniff their manure though. That bit I didn't make up.